The list of restaurants I’d like to visit in Brooklyn keeps growing, and I just added one more to it. Saltie is a sandwich shop that specializes in putting classic combinations of things that might not have been thought of as sandwiches before between pieces of bread. They rely on local and seasonal ingredients and make their breads, mayonnaise, vinaigrettes, pickles, yogurt, sweets, and soups from scratch. The new book from the shop is Saltie: A Cookbook , and I received a review copy. The recipes include the focaccia and naan they use for sandwiches as well as all the condiments, pickles, and other items they prepare. A few of the sandwiches that jumped out at me were the Curried Rabbit which is a play on Welsh rarebit with cheddar, curried mayonnaise, apple salad, and currant pickle; the Spanish Armada with potato tortilla and pimenton aioli; and the Henry Hudson with fried green tomatoes, bacon, mayonnaise, and fresh basil. Then, from the Soups section, there’s a Cauliflower, Leek, and Gruyere Soup and a Curried Squash and Red Lentil Soup I want to try. There are also salads with greens, grains, and bread in some cases. Every dish offers a fresh, savory mix of things you know will taste great together. For instance, I already had a thing for the combination of beets and hard-boiled eggs. So, the Scuttlebutt sandwich had to be my first stop in the book. It’s built on freshly-baked focaccia and layered with pimenton aioli, feta, and black olives. I couldn’t wait to taste it. First, I followed the recipe from the book for focaccia with an easy, no-knead process. The dough was mixed, then transferred to an oiled bowl, and then refrigerated for anywhere from eight hours to two days. The dough was spread on a baking sheet and left to come to room temperature before being dimpled, sprinkled with salt, and baked. Up next, I made the pimenton aioli. As usual, I’m not capable of making a mayonnaise or aioli in a food processor or blender. I only seem to have luck with a hand mixer. I eventually got a good emulsion. A day in advance, I roasted and pickled some beets, and the pickled beets will last in the refrigerator for up to two months. For the hard-boiled eggs, the authors offer an interesting technique. They suggest poking a hole in the big end of each egg with a thumbtack. The tack should be twisted into the shell and pushed all the way in until the flat part of the tack touches the shell and then removed. Then, the eggs were placed in boiling water and left for ten minutes before being transferred to ice water. I was using very fresh, local eggs, and the shells did come off more easily than they usually do. So, I’ve been repeating this for all the eggs I’ve boiled since. 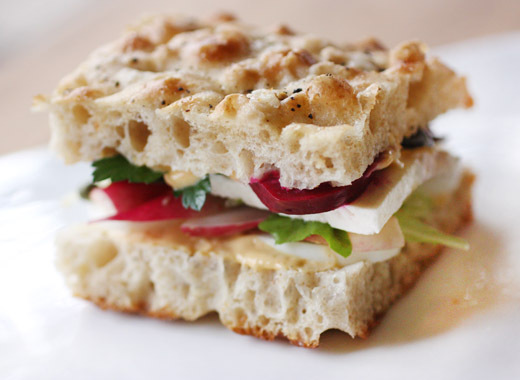 To make the sandwich, the focaccia was cut into squares and sliced in half horizontally. On the cut sides, the pimenton aioli was spread on each piece. Then, sliced hard-boiled egg was added followed by a mix of black olives, capers, herbs, sliced green onion, and sliced radishes. I added the sliced pickled beets last with sliced feta. This was one of those deliciously messy sandwiches in which everything wants to squish out the sides and you try to keep things intact since you don’t want to lose a single bit of it. You could give up and attack it with a fork and knife, but where’s the fun in that? Until I can plan a food tour of Brooklyn, I’ll keep sampling more things from this book. Recipe re-printed with publisher's permission from Saltie: A Cookbook . There is so much to say about the Scuttlebutt. It really has earned its gossipy title. It’s the sandwich that is most likely to change, as the ingredients rotate with the seasons and with what’s in the refrigerator. In summer, it has tomatoes and arugula; in winter, squash and a chiffonade of Tuscan kale. There is a rotating cast of pickles, the most popular being the beet. Some people order the Scuttlebutt as “the sandwich with the beets,” which never fails to disappoint when those particular pickles are off the menu. The staple ingredients remain pimentón aioli, hard-boiled egg, feta, capers, and olives. The rest is a free-for-all that for some can end in tears. The Scuttlebutt makes people emotional. It is an exercise in impermanence. Cut the focaccia in half horizontally and put on a plate, cutsides up. Spread both cut sides with aioli. 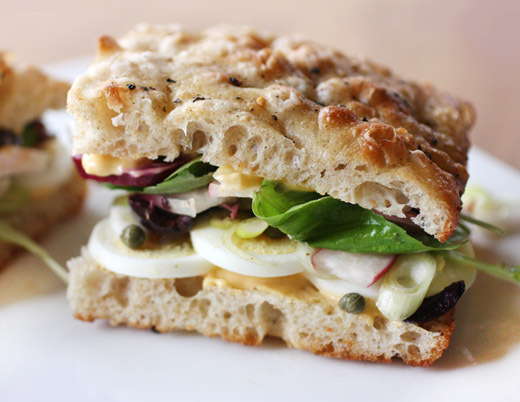 Arrange the egg slices evenly on the bottom half of the bread. Set aside. In a bowl, toss the olives, capers, herbs, pickles, and radish (if using) with just enough olive oil to coat lightly. Mound the salad on top of the egg. If you can, slice the feta and arrange on top of the salad. If you can’t get a nice even slice of feta, you can either crumble it on top of the salad (although it will tend to roll off the top of pile), or you can toss the feta with the salad. Quickly replace the top of the bread before the sandwich falls apart, pressing gently to help it hold together, and serve right away. Focaccia is the bread that we use for most of the sandwiches at Saltie. The reasons for choosing this soft-but-chewy Italian yeast bread were equally pragmatic and delicious. We considered what we could reasonably produce and decided a bread that we could make on a baking sheet would be much more economical in terms of time and space than one that required more individual attention. As has been the case with many of our choices at Saltie, landing on focaccia at first may have seemed the solution to how to do something in the best and most efficient way, but it quickly became the fact-of-the-matter only possible choice that it is today. Now I can’t imagine life without focaccia. Its fluffy, oily welcome greets me daily. Preheat the oven to 450°F. In a large bowl, whisk together the flour, salt, and yeast. Add the warm water to the flour mixture and stir with a wooden spoon until all the flour is incorporated and a sticky dough forms (no kneading required). Pour the 1/4 cup olive oil into a 6-quart plastic food container with a tight-fitting lid (see Note). Transfer the focaccia dough to the plastic container, turn to coat, and cover tightly. Place in the refrigerator to rise for at least 8 hours or for up to 2 days. When the dough is ready, it should be room temperature, spread out on the sheet, and fluffy feeling. Pat down the focaccia to an even thickness of about 1 inch on the baking sheet tray and begin to make indentations in the dough with your fingertips. Dimple the entire dough and then drizzle the whole thing again with olive oil. Sprinkle the entire surface of the focaccia evenly with sea salt. Bake, rotating once front to back, until the top is uniformly golden brown, about 15 minutes. Transfer to a wire rack to cool, then slide out of the pan. Use the same day. Note : This easy recipe calls for a large plastic food-storage container, about a 6-quart capacity, with a tight-fitting lid. Otherwise, you can use a large mixing bowl and cover the dough with plastic wrap. Unfortunately, focaccia suffers a rapid and significant deterioration in quality after the first day. It is also impossible to make bread crumbs with focaccia. Ideally, bake and eat focaccia on the same day. If there is some left over, wrap it tightly in plastic and store at room temperature for one day more. Day-old focaccia is delicious in soup. These are the pickles that have caused our customers to ask for the Scuttlebutt not by name but as “the sandwich with the beets on it.” People love beets! Go figure. Here’s what they are talking about. Preheat the oven to 400°F. 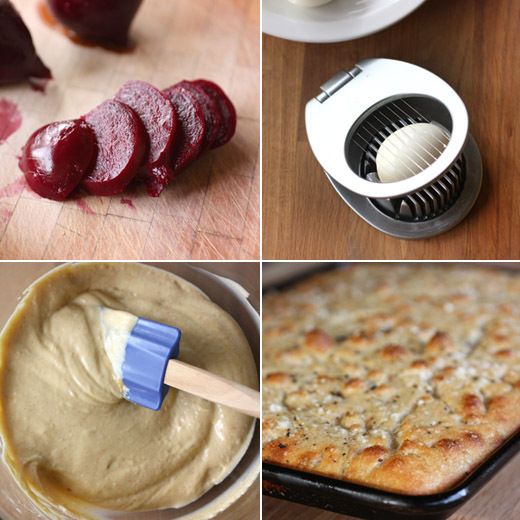 Put the beets in a roasting pan. Add just enough water to the pan to evenly cover the bottom. Salt the beets and drizzle with olive oil. Cover with aluminum foil and roast until tender when pierced with a knife, about an hour, depending on the size. Let cool until you can handle them, then peel the beets, slipping the skins off with your fingers or a kitchen towel and using a paring knife where they stick. Cut into slices 1/4 inch thick and put in a large, heatproof bowl. In a saucepan, combine the vinegar, water, sugar, salt, and spices and bring to a boil over medium-high heat, stirring to dissolve the sugar and salt. When the sugar and salt have dissolved, pour the pickle over the beets. Let the pickles cool at room temperature and then put them into a plastic or glass container, cover, and refrigerate. The pickled beets will be ready to eat the next day and will keep for up to 2 months. Follow the main recipe, substituting 4 large red onions, thinly sliced, for the beets. I’m a big believer that homemade is always best. The flavor is always far better than anything packaged, and I like being able to choose each ingredient myself. In fact, I almost never buy packaged snacks because of all those things on the ingredients lists that I’d rather avoid. So, I was immediately drawn to the new book from Lara Ferroni Real Snacks: Make Your Favorite Childhood Treats Without All the Junk , and I received a review copy. These versions of popular snacks not only cut out all the preservatives since they’re homemade, they’re also made with whole grains in some cases and less-refined sugars. Of course there are instructions for making your own Twinkies, Pop Tarts, Nutter Butters, and more sweets, and there are also recipes for Cheesy Squares, Corn Chip Strips, and Nacho Cheese Tortilla Chips. There are even a few dips, Potato Chips, and Hot Pockets. Most recipes even have options for making them gluten free and/or vegan. I wanted to try the homemade Oreos first because I knew they’d be on another level compared to the store-bought ones. 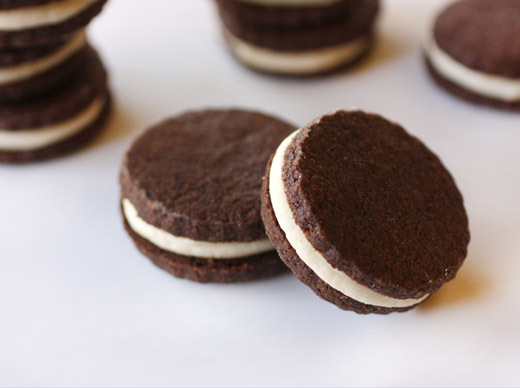 As a kid, I never really liked the middle of an Oreo because it didn’t taste like much to me. I was pretty sure I’d have a different experience with these. The cookie dough is easy to make with a food processor. 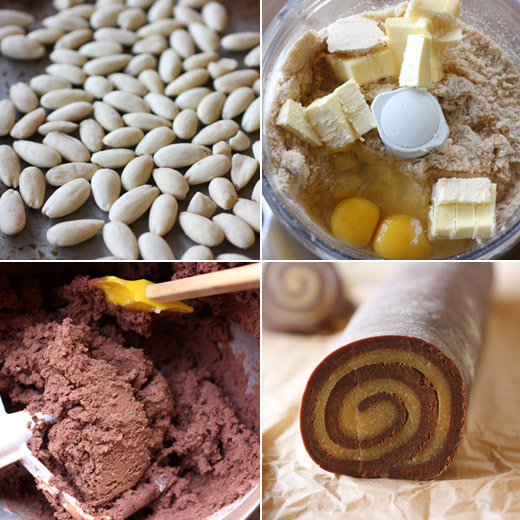 Whole wheat pastry flour, teff flour (or whole wheat flour), cocoa powder, muscovado sugar, salt, and baking soda were combined in the food processor and pulsed to mix. Cubed butter was dropped into the food processor one piece at a time while pulsing. The dough started becoming crumbly which is what you want it to do. Last, a little milk and vanilla extract were added while the machine was running, and the dough formed a ball. I wrapped the dough in plastic wrap and chilled it for about 30 minutes before rolling it out. For rolling, I placed the flattened dough between sheets of parchment paper since it was a little sticky. That way, extra flour wasn’t worked into it while rolling. The dough was rolled to a little thicker than one quarter inch, and one and a half inch circles were cut. 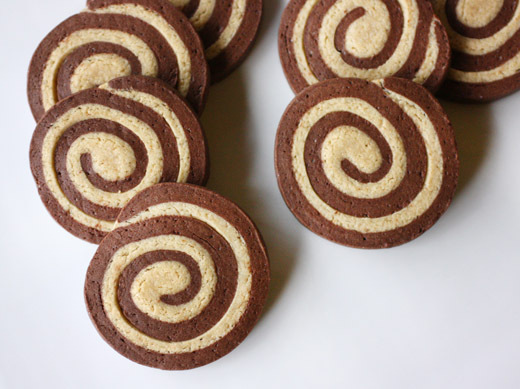 Although the yield for this recipe is noted as 40 cookies, I got exactly 24 circles even with re-rolling dough scraps. The cookies baked for about 10 minutes and were left to cool. The filling was made with butter, vanilla extract, a pinch of salt, and confectioners’ sugar. There are recipes in the book for pantry items like homemade confectioners’ sugar, vanilla and mint extracts, marshmallow crème, etc. I made the confectioners’ sugar which was a simple matter of placing granulated sugar and cornstarch in the blender and letting it run for about five minutes. In the end, I didn’t find the flavor much different from the organic confectioners’ sugar I buy in bags, but it’s nice to know I can whip some up if I find I have an empty bag and don’t feel like going to the store. I used a plastic bag with the corner snipped to pipe the filling onto the flat sides of half the cookies. They were sandwiched and left to set up for about 10 minutes before a first taste. If Oreos had always been this good, I would have been a huge fan. These were definitely worthy of being twisted apart for licking the middle, and they were great for biting right through to taste the cookie and filling at the same time. I want to try the Corn Chip Strips next or the Cheese Squares or maybe the homemade Nutter Butters. I’ll definitely be making more homemade versions of snacks. Recipe excerpted from Real Snacks: Make Your Favorite Childhood Treats Without All the Junk by permission of Sasquatch Books. Copyright 2012 By Lara Ferroni. All rights reserved. There are two types of people in this world: those who eat their Oreos in one piece and those who carefully twist them open to expose their delicious insides, lick them clean, and then dunk the dark chocolate wafers into milk until they are perfectly soggy. Guess which one I am. To make the cookies, combine the whole- wheat pastry flour, teff flour, cocoa powder, sugar, salt, and baking soda in the bowl of a food processor fitted with the dough blade (or in the bowl of a stand mixer fitted with the paddle attachment). Pulse several times to mix thoroughly. Drop in the butter 1 table- spoon at a time and pulse to create a crumbly mixture. Then, with the food processor running, drizzle in the milk and vanilla. Mix until the mixture starts to stick together, about 1 minute. Preheat the oven to 350°F. Line 2 baking sheets with parchment and set aside. Turn the dough out onto a lightly floured surface. Roll out the dough until it is a little less than 1⁄4 inch thick. Use a 1- to 2-inch round cookie cutter to cut out the cookies (you can reroll any scraps). Place the cookies on the prepared baking sheet. Bake until set, 10 to 12 minutes. Allow the cookies to cool completely on a wire rack before filling. While the cookies are baking, make the filling. With a hand mixer or in the bowl of a stand mixer fitted with the paddle attachment, cream the butter, vanilla, and salt until smooth, about 1 minute. Gradually add the powdered sugar until fully incorporated. Spread about 1 teaspoon of filling on half of the cooled cookies. 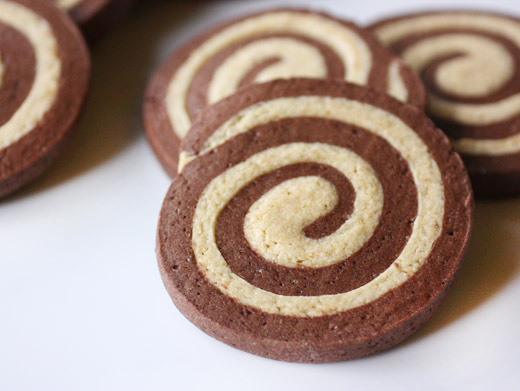 Top with the remaining cookies and gently twist to seal. Let sit for 10 minutes before indulging. 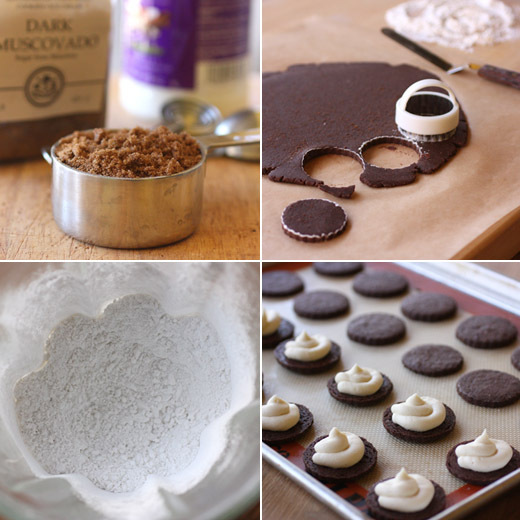 For gluten-free Crème-Stuffed Chocolate Cookies, replace the whole-wheat pastry flour with an equal amount of gluten-free all- purpose baking mix. Roll out the dough between two pieces of parchment for easier rolling. 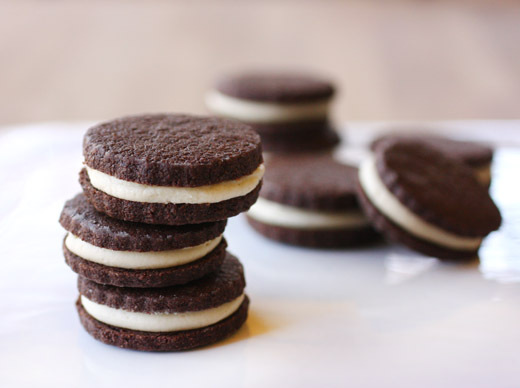 For vegan Crème-Stuffed Chocolate Cookies, replace the butter with an equal amount of coconut oil and the milk with an equal amount of almond milk. I thought I knew chiles. I certainly use several different varieties in my cooking in fresh, dried, roasted, and pickled states. But, when we were in Spain in October, I encountered a type of chile I’d never tasted or even seen at home before and quickly realized I wouldn’t be able to live without it. In the Basque region, these chiles are called guindillas, and elsewhere they’re sometimes called piparras. They’re skinny and light green and have a mild flavor. We saw pickled ones used again and again in pintxos, and then we also found fresh versions of them at a market. The fresh ones were delicious seared and salted just like padron peppers, and the pickled ones were delightful. I started calculating how many jars of these pickled guindillas I could fit in my suitcases and then wondered how long those jars would last already dreading the day they’d be gone. Later, all those worries were washed away when I learned of an online source for gourmet Spanish food products. At Raposos Gourmet, you can find jars of guindillas, piquillos, Spanish olives oils, rice for paella, pimenton, vinegars, jamon, and more. I received some items to sample including an organic Spanish extra virgin olive oil, a basil olive oil, a rosemary olive oil, a jar of guindillas, and a jar of piquillos. With all of this in hand, I was ready to recreate some of the pintxos we enjoyed so much in San Sebastian. There are some traditional types of pintxos, but for the most part, in creating them you’re only limited by your imagination. A common one, and one of my favorites, is the Gilda which is a guindilla pepper, an olive, and an anchovy fillet on a pick. I turned to the book Rustica for inspiration for a couple of other skewered ideas. The first was the Zigala which involves slowly oil poaching shrimp. I cleaned and deveined the shrimp and then skewered each one onto a pick to keep them straight while cooking. I used the Spanish olive oil I had received and brought it to just 170 degree F in a saucepan. You need a thermometer to be sure the temperature doesn’t rise above that point and enough oil in the pan to cover the shrimp. The shrimp sit in the warm bath of oil and you watch as their color slowly changes while they cook. The cooking time will vary depending on the size of the shrimp used, but you can easily watch to see when they are just cooked through. Mine took about 12 minutes or so. In the book, the shrimp was wrapped with a thin slice of jamon before being cooked, but I omitted the ham. 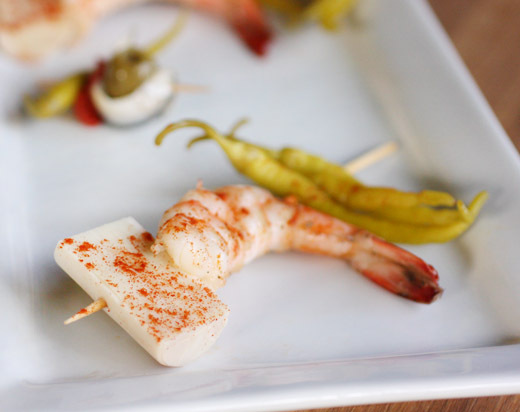 The picks used for cooking were removed, and the shrimp were skewered on clean picks for serving along with a chunk of heart of palm and some guindillas. The Zigalas were sprinkled with pimenton before serving. 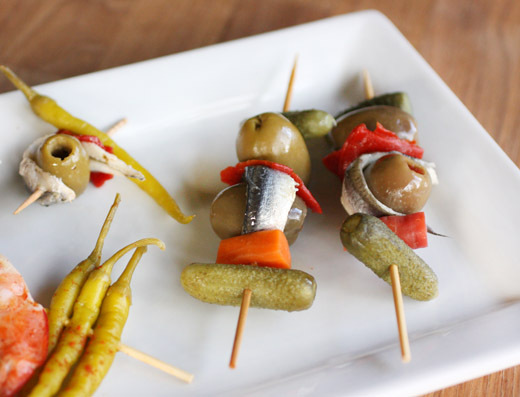 The second pintxo variety I found in the book was Banderillas which are simple stacks of cornichon, pickled carrot, an anchovy-wrapped olive, a piece of piquillo, and another cornichon. Food on picks is great for parties, and it’s infinitely adaptable. For instance, the banderillas were supposed to have cocktail onions which would have added a nice white element on the pick, but I skipped them. On the Zigalas, you could use pieces of artichoke hearts instead of hearts of palm and mix up the seafood with some shrimp and some scallops. 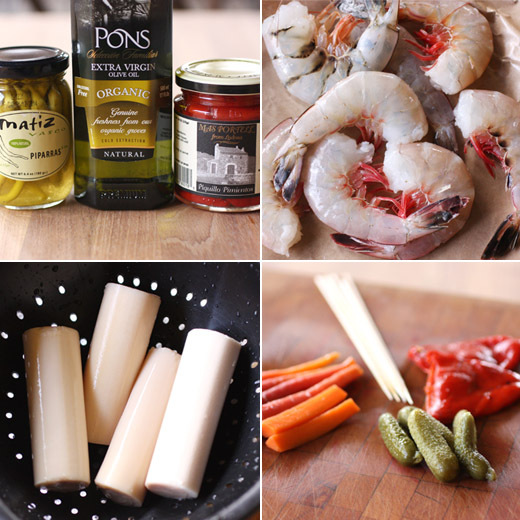 This was an easy way to recreate some tastes of Spain, and I’m so relieved that I can now easily restock my precious guindillas whenever I want. I’m always looking for an excuse to bake cookies. Isn’t everyone? With the new book The Daily Cookie , you’re given 365 reasons to do just that. And, those reasons don’t need to be big events. That’s the fun of the book. I received a copy for review. The book, written by Anna Ginsberg, includes a different cookie recipe for each day of the year to correspond with either a holiday or anniversary or something like the day “C is for Cookie” was first performed on Sesame Street or International Picnic Day. There are bar cookies like Strawberry Malt Swirl Brownies, Nanaimo Bars, and several types of brownies, drop cookies, roll and cut cookies, biscotti, sandwich cookies, and waffle cookies to name a few. 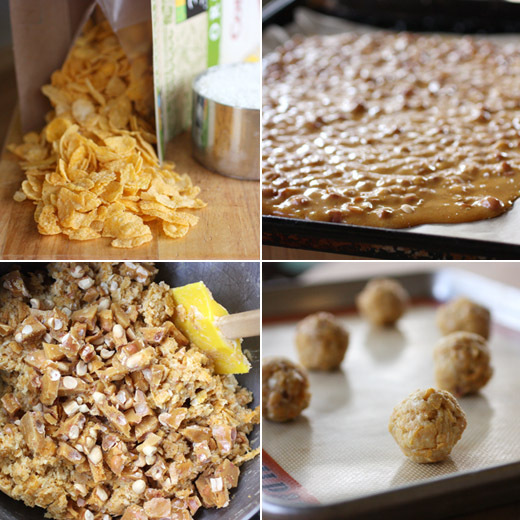 I was intrigued by the Cornflake and Peanut Brittle Cookies because I’d never thought of using crushed peanut brittle in a cookie before. Then, I read a few more pages and found the recipe for Chipotle Beer Brittle that I had to try, and the plan was set in motion. For the cookie, any peanut brittle would have worked, but I had just decided to make the chipotle beer version so I used it. The brittle has just a scant amount of chipotle powder and just a quarter cup of ale, so those flavors aren’t overwhelming. While eating the plain peanut brittle, you get subtle hints of the smoky chipotle which is a nice contrast to the sweetness. The peanut brittle was made in the usual way. The differences here were that when the sugar and corn syrup were placed in a saucepan to be heated, rather than adding water, beer was used. Then, after the sugar and peanut mixture came up to temperature, chipotle powder was added with the salt and baking soda along with butter and vanilla. I made the brittle a day in advance and chopped enough for the cookies just before starting that recipe. For the cookies, I actually doubled the recipe since it was time to send off more birthday cookies. The cookie dough was started by combining the dry ingredients in a separate bowl before creaming butter with light brown sugar and granulated sugar in a stand mixer. Two eggs (for the doubled amount) and vanilla were added followed by the dry ingredients, crushed cornflakes, crushed peanut brittle, and coconut. The dough was scooped into balls and baked for about twelve minutes. I loved the mix of textures in these cookies. 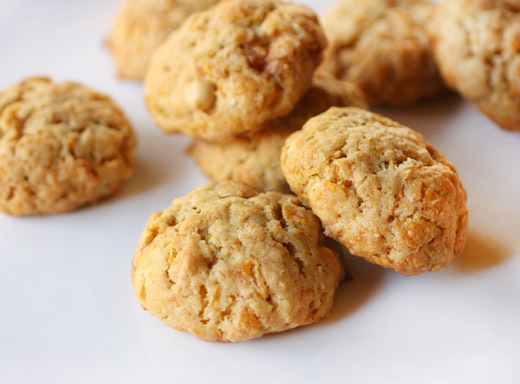 There were crispy cornflake pieces, crunchy bits of brittle, and chewy coconut packed into each tender cookie. Next, I want to try the Birdseed Bars, Almond-Topped Shortbread Bars, and the Chai-Chocolate Banana Tea Bars. And, I won’t need to wait for an occasion since the recipes come with built-in reasons to bake. Recipes re-printed with publisher’s permissions from The Daily Cookie , by Anna Ginsberg/Andrews McMeel Publishing, LLC. National Tooth Fairy Day No one knows the Tooth Fairy’s real age, but parents have been telling their children about her since the early 1900s. There are other ways of dealing with tooth loss. Vikings paid their kids for each tooth and put them on a string, whereas in medieval Europe, they buried teeth in the garden. Some Latin countries have the “tooth mouse,” while in Asia it is customary to throw the lost tooth over the roof. 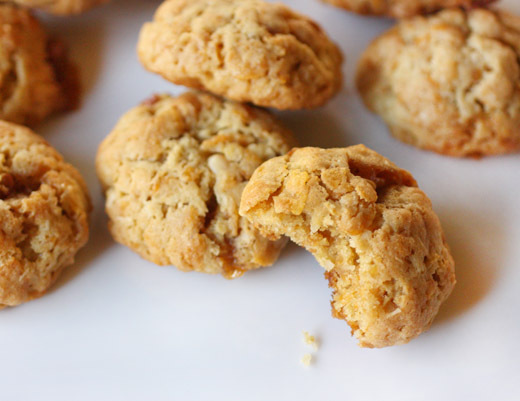 You won’t really lose a tooth on these cookies—or at least I hope not. But if you do, the cookies are worth it. Other Events on This Day: The schooner America won a yachting competition in 1851 in England. It was the namesake for the America’s Cup. 1. Preheat the oven to 350°F and place a rack in the center. Line two baking sheets with nonstick foil or parchment paper. 2. Mix the flour, baking soda, baking powder, and salt together in a medium-size bowl; set aside. 3. In the bowl of a stand mixer fitted with a paddle attachment, or in a large mixing bowl, using a handheld electric mixer, beat the butter and both sugars on medium-high speed until light and creamy. Beat in the egg and vanilla and continue mixing on medium-high speed for another minute. By hand, stir in the flour mixture until incorporated. Stir in the cereal, peanut brittle, and coconut. 4. Scoop up level tablespoonfuls of batter and shape into balls. Arrange the balls about 2 1/2 inches apart on the prepared baking sheets. Bake for 10 to 12 minutes, or until the edges are lightly browned. Let cool on the baking sheet for about 3 minutes, then transfer to a wire rack to cool completely. World Science Day Established by UNESCO in 2001, World Science Day aims to raise awareness of scientists around the world, renew the commitment to use science for society’s benefit, and draw attention to scientific challenges. Or in this case, candy challenges. Making candy is a very practical and tasty scientific exercise, which is why students make it (sans beer) over Bunsen burners in high school science class. 1. Line a large rimmed baking sheet with nonstick foil or parchment paper and have ready a candy thermometer. 2. Mix together the salt, baking soda, and chipotle powder and set next to the stove. Measure out the butter and vanilla and have them ready, too. 3. In a 3-quart nonstick saucepan, combine the sugar, corn syrup, and beer. Bring to a boil over medium heat. Add the peanuts and continue to cook, stirring, until the temperature of the mixture reaches about 250°F, at which point you want to stir constantly to keep the peanuts from burning. Continue to cook, stirring, until the temperature reaches exactly 300°F. Remove from the heat and quickly stir in the butter, vanilla, and chipotle mixture. 4. Pour onto the prepared baking sheet. If you want to make the brittle a little thinner, tilt the baking sheet slightly so it spreads, but don’t tilt it so much you burst all the nice air bubbles. Let the mixture stand at room temperature until it hardens, then break into pieces. Baker’s Note: If you can’t find raw peanuts, use unsalted dry roasted peanuts and add them when the temperature is between 240° and 250°F on the candy thermometer. There are plenty of challenges for a restaurant to source all of its food locally in a place like Austin where we have 80 degree December days when the farmers’ markets are bursting with great produce. So, imagine what it must be like to rely on local ingredients at a restaurant in Sweden where winter is long and dark and summer is brief. And yet, that challenge is just what makes Faviken Magasinet, a mountain estate and restaurant in northern Sweden, so interesting. In the new book Faviken , Magnus Nilsson describes how he transformed the menu to take advantage of the best of locally produced food and make the remote restaurant a destination. I recently received a review copy of the book. The restaurant’s menu changes throughout the year and even from day to day depending on what’s available. Gardens just outside the kitchen supply freshly-picked vegetables and herbs in the summer, and that produce is then carefully stored, dried, pickled, fermented, or otherwise preserved for winter use. For meats, Nilsson has sought out specific breeds of animals, raised ethically to the ages he prefers, from nearby farms. For instance, his preference for beef is that from dairy cows that are five to ten years old. The chicken, which happens to be Brahmas, are raised to an age of about eight months, and along with ducks, geese, and quails, they’re raised for the restaurant at a local farm. Game is hunted, wild herbs and berries are foraged, and fish is brought from the closest shore. It was fascinating to read about dinner service at Faviken and how precisely everything is timed. The dining room seats sixteen, and everyone is seated and served at the same time. The carefully chosen, dried, cut, and precisely cooked meats are placed on warmed plates which are hurried to the dining room. There’s a practiced choreography of cooking, plating, and delivery. In the summer, vegetables are picked in the garden moments before they land on plates. Kale is described as “steamed so briefly that it is dying on the plate.” I’d love to see this kitchen in action, and I’d love to taste the food. The recipes in the book are presented exactly as they are prepared in the restaurant. That means some ingredients and techniques seem very particular like “one lavender petal from last summer” and “vinegar matured in the burned-out trunk of a spruce tree.” But, I took the recipes as inspiration to think seasonally about what’s available here and now. I was intrigued by a dish in the book that included a pork chop and semi-dried pickled root vegetables. 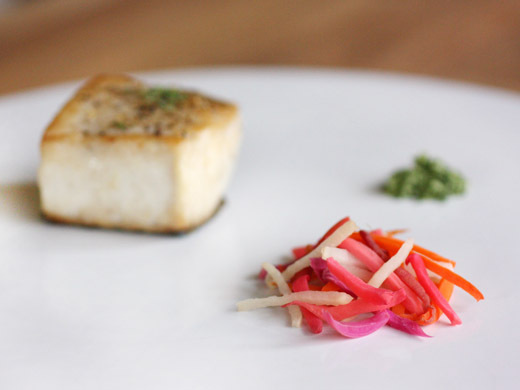 I replaced the pork with a simply seared piece of fish, and focused on the pickled vegetables. 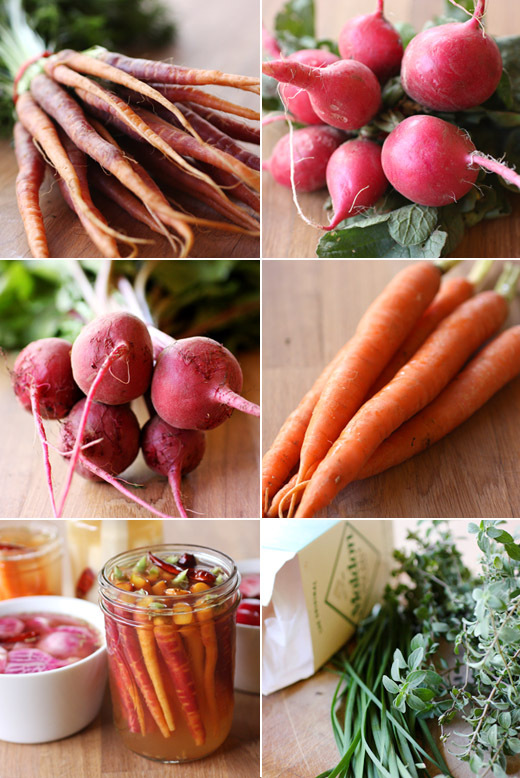 I stopped by the farmers’ market and found two kinds of carrots, Chioggia beets, red radishes, and daikon radish. I made a brine with apple cider vinegar, sugar, and salt and added fennel seeds, black peppercorns, and dried red chiles. The chopped root vegetables became quick, refrigerator pickles which I chilled for a few days. Then, I followed the instructions for the semi-dried pickled vegetables in the book. The vegetables were sliced and left on a parchment-lined baking sheet to dry for a couple of days. Then, they were sliced into skinny sticks. I also made the herb salt from the book which is one way fresh herbs are preserved for the winter at the restaurant. I gathered oregano and chives from my herb garden, chopped them in a food processor, mixed them with sea salt, and pushed the mix through a sieve. 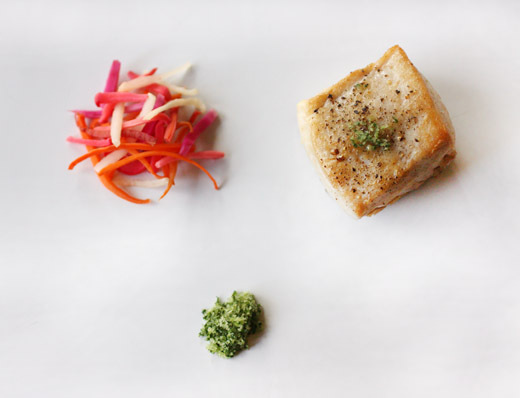 Nilsson explains that as the herb salt slowly dulls over the winter months, he finds the change in flavor interesting. To keep the herb salt bright green, it can be stored in the freezer. The semi-dried pickled vegetables were chewy and maintained good puckery flavor. They were a great match to a simple piece of fish, and the herb salt added a fresh savoriness. I didn’t attempt to create a full progression of dishes as would be served at the restaurant, but I enjoyed taking bits and pieces from the book for a simple meal. There’s a lot to be inspired by in the book and applied to what’s available wherever you’re cooking. This is a great time of year to add another dip to your repertoire, especially a warm dip with cheese scattered on top that turns golden as it bakes. And, this is one of the simplest out there. Rather than mixing the primary ingredients with mayonnaise or sour cream as is customary, this dip is made up of pureed, roasted fennel and garlic. There are only four ingredients in this dip if you don’t count the salt and pepper, but those are four very flavorful ingredients that make the end result seem a lot more complicated. I saved this recipe from the Thanksgiving dinner story in the November 2010 issue of Living magazine. The dip was served as a starter along with kale chips with sea salt and lemon which were made in the usual way by chopping kale leaves, tossing with olive oil and salt, and then roasting until crisp. The twist was that when the kale chips came out of the oven, they were topped with lemon zest. I liked the idea of having crispy, lemony chips with the warm, rich dip. 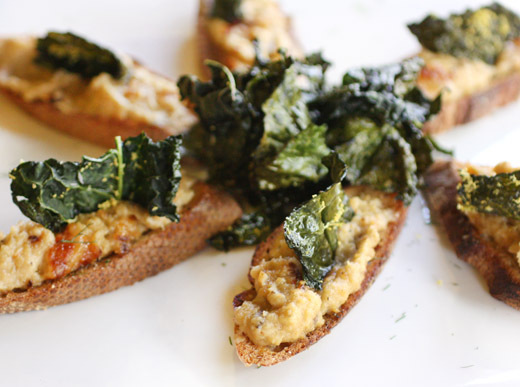 So, I served the dip already spread onto little toasted pieces of bread with a kale chip nestled on top and more chips piled in the middle of the platter of toasts. You start by trimming and removing the core from three fennel bulbs and then chopping them into thick wedges. The fennel wedges are then browned in a skillet with extra-virgin olive oil. Four or five peeled, whole, and slightly smashed garlic cloves are added as the fennel browns. Then, the fennel is turned, seasoned, the skillet was covered with foil, and it’s placed in a 400 degree F oven for about 30 minutes. The fennel and garlic should become completely tender and sweet. Next, the roasted fennel and garlic was transferred to a food processor and pureed until smooth. Grated parmigiano reggiano was added and mixed in, and then you should taste for seasoning. 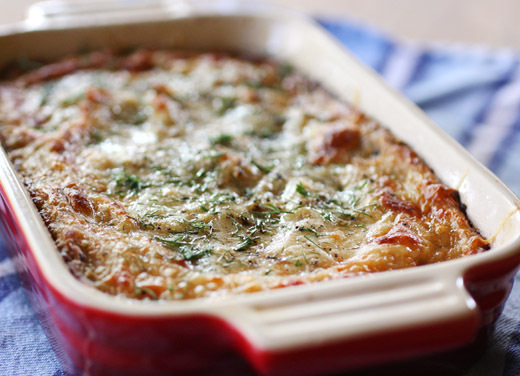 The puree was scooped into a small baking dish and topped with more grated parmesan before it went back into the oven that had been turned up to 450. After about 20 minutes, the dip was warmed through, and the cheese on top was invitingly browned. I toasted some sliced, homemade, sourdough baguette as the dip baked, and popped the kale chips into the oven as the dip cooled a bit. 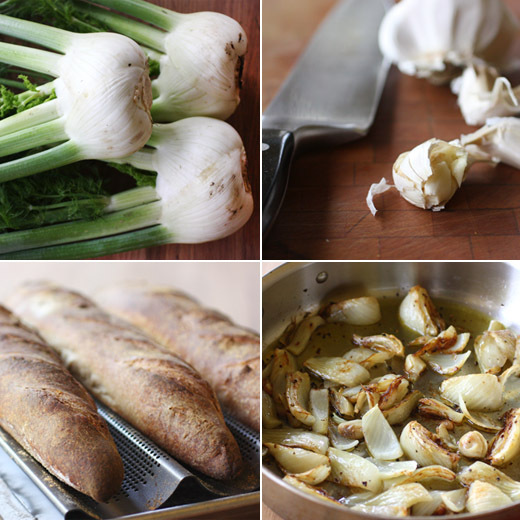 Mellow roasted garlic and fennel with the big flavor of parmesan makes for a delicious mix. With that much flavor, you'd never guess how short the ingredient list actually is. And, the hit of lemon on the kale chips was a nice, perky contrast to the savory dip. Since it’s easy to make the dip in advance, chill it, and bake it just before serving, this will definitely be a go-to recipe for holiday parties.